37 Fairfield (239 Newbury) is located on the NW corner of Fairfield and Newbury, with 35 Fairfield to the north, 39 Fairfield (240-A Newbury) to the south, across Newbury, 38 Fairfield (235 Newbury) to the east, across Fairfield, and 245 Newbury to the west. 37 Fairfield was built in 1877-1878 for banker and real estate investor Asa Perkins Potter, one of eight houses, four on each side of the block: 31-33-35-37 Fairfield on the west and 32-34-36-38 Fairfield on the east. He and his wife, Delle (Sheldon) Potter, lived at 29 Fairfield, built at about the same time. Click here for an index to the deeds for 37 Fairfield. On March 31, 1879, 37 Fairfield was purchased from Silas Merrill by Dr. Edward Wigglesworth, a dermatologist. He lived at 81 Beacon with his mother, Henrietta (Goddard) Wigglesworth, the widow of Edward Wigglesworth. By 1880, 37 Fairfield was the home of Mrs. Sarah Willard (Johonnot) Frothingham. In 1878, she had lived at 36 Cortes. In April of 1882, Edward Wigglesworth and Sarah Frothingham were married. They subsequently lived at 37 Fairfield through the 1884-1885 winter season, after which they moved to 188 Beacon. On June 5, 1885, 37 Fairfield was purchased from Edward Wigglesworth by leather and hide dealer William A. Foster. He previously had lived at 108 Boylston. In December of 1885, he married Emma Augusta Goodwin and they made 37 Fairfield their home. By the 1889-1890 winter season, they had been joined at 37 Fairfield by Emma Foster’s parents, George L. Goodwin and Julia Ann (Pierce) Goodwin. He was assistant treasurer of the Santa Fe Railroad. They previously had lived at the Hotel Brunswick (southeast corner of Boylston and Clarendon). Julia Goodwin died in January of 1890. The Fosters and George Goodwin continued to live at 37 Fairfield during the 1891-1892 season, but moved thereafter to Newton Centre. On November 14, 1891, 37 Fairfield was purchased from William Foster by Francis G. Pratt, Jr. He was a publisher with Perry Mason & Company, publishers of the Youth’s Companion magazine. On September 8, 1892, the Youth’s Companion published for the first time the Pledge of Allegiance, written by the magazine’s staff member, Francis Bellamy. As a child, author Earl Stanley Gardner was an avid reader of the Youth’s Companion and used the name of its publisher for his fictional character Perry Mason, a defense attorney who was the main character in more than 80 detective novels and short stories, films, and radio and television series. Francis Pratt died in March of 1894. He was unmarried. On March 2, 1895, 37 Fairfield was purchased from Francis Pratt’s heirs (his mother, Charlotte G. (Eddy) Pratt, the widow of Francis G. Pratt, and his brother, George W. Pratt) by Eliza Maria (called Maria) (Upham) Drake, the wife of James McEwen Drake. They previously had lived at 14 Claremont Park. James Drake (like Francis Pratt) was a publisher with Perry Mason & Company. The Company was owned by Daniel Sharp Ford, the husband of Maria Upham Drake’s aunt, Sarah E. (Upham) Ford. Maria Drake died in September of 1920. James Drake continued to live at 37 Fairfield until his death in December of 1934. Their daughter, Stella Dorothy Drake, lived with him. 37 Fairfield was inherited from the Drakes by Vassar College. On November 6, 1936, it was acquired from Vassar by real estate dealer Ray C. Johnson, and on April 22, 1937, it was acquired from him by Philip D. Clark. In 1936, 37 Fairfield was the home of Roger C. Smith, an accountant, and his wife, Sadie (Sydia) J. (Trudeau) Smith. They previously had lived at 97 Gainsborough. The house was shown as vacant in the 1937 City Directory. By 1938, 37 Fairfield was the home of George Arthur Thompson and his wife, Nellie (Burt) Thompson. They previously had lived in Norfolk, Massachusetts. It was also the location of his rug store. By 1939, they had moved to 245 Newbury. On November 1, 1938, real estate dealer H. Leon Sharmat foreclosed on a mortgage given by Philip Clark and transferred 37 Fairfield to Rebecca Silberman. 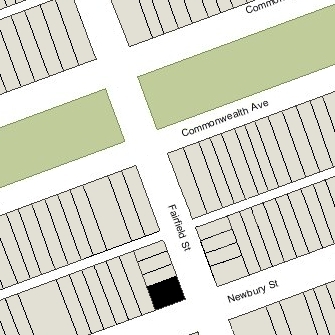 37 Fairfield was shown as vacant in the 1939 City Directory. On August 17, 1939, 37 Fairfield was acquired from Rebeccca Silberman by Charles E. Donovan and his wife, May C. (Fay) Donovan. 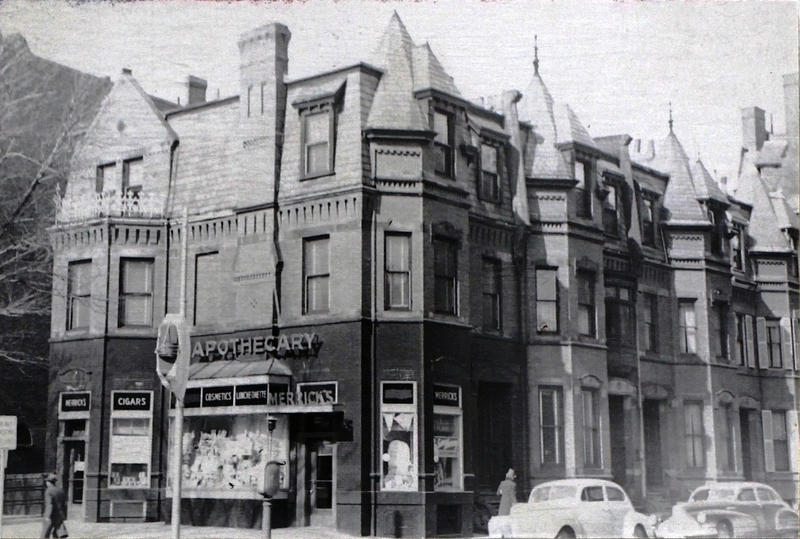 By 1940, 37 Fairfield was the home of John E. Merrick, a pharmacist, and the location of his drugstore (with an address of 239 Newbury). He previously had lived at 72 Linden. He continued to live and maintain his store at 37 Fairfield/239 Newbury in 1941. By 1942, 37 Fairfield was a two-family dwelling. One of the apartments was the home of William F. Geary, an iron and sheet metal worker, and his wife, Catherine H. Geary. They previously had lived in Lowell. They continued to live at 37 Fairfield until about 1963. The other apartment was the home of Martin F. Glynn, a policeman, and his wife, Frances C. (O’Toole) Glynn. They previously had lived at 18 Perkins Square. They continued to live at 37 Fairfield until about 1954. John E. Merrick continued to operate his drugstore at 239 Newbury in 1942, but by 1943 it had become the Fairfield Pharmacy. In February of 1946, Charles Donovan applied for (and subsequently received) permission to remodel the interior. The current and proposed use was indicated as being a two-family dwelling and store. By 1946, the Fairfield Pharmacy was owned by Maxwell A. Grosser and his wife, Frances C. (Matfess) Grosser. They lived in Mattapan and later in Brookline. Charles Donovan died in January of 1952, and on January 13, 1954, 37 Fairfield was purchased from May Donovan by Maxwell and Frances Grosser. On January 15, 1959, 37 Fairfield was acquired from the Grossers by Saul Parker and Ruth (Gilman) Parker, trustees of the Hosmer Realty Trust. The Parkers lived at 31 Hosmer in Mattapan and later in Milton. Saul Parker was the president and treasurer of the Fairfield Pharmacy, which continued to be located at 239 Newbury until about 1976. On November 18, 1976, 37 Fairfield was acquired from the Parkers by Robert B. Aiello, trustee of the 239 Newbury Street Realty Trust. 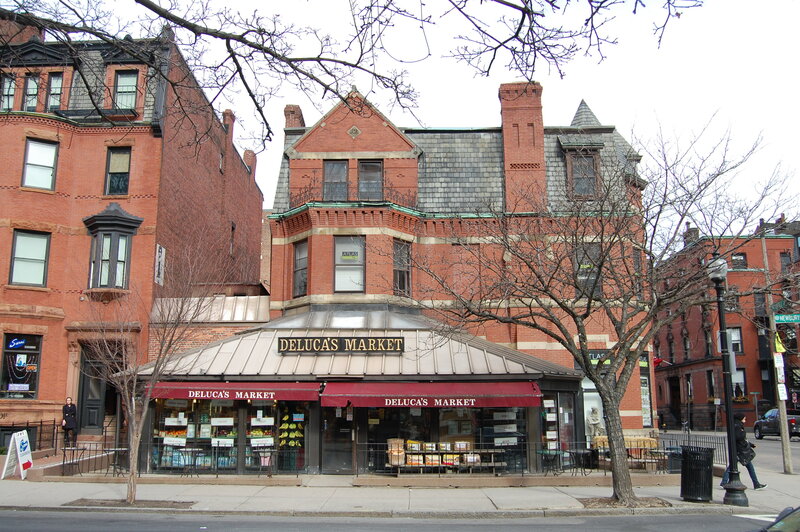 He replaced the Fairfield Pharmacy with DeLuca’s market, establishing a Newbury Street branch of the Aiello family’s store located at 11 Charles Street. In April of 1995, he applied for (and subsequently received) permission to add a restaurant with takeout to the existing retail grocer store. On October 29, 2001, Robert Aiello terminated the 239 Newbury Street Realty Trust and distributed ownership of 37 Fairfield to the beneficiaries: Gerald A. Aiello; Robert B. Aiello, trustee of the Caroline Grace Aiello Trust; and Virgil J. Aiello, trustee of the Sandra, Gina, Nicholas, Alison Trust. On June 18, 2003, Gerald Aiello sold his one-third interest in the property to Robert B. Aiello and Virgil J. Aiello. 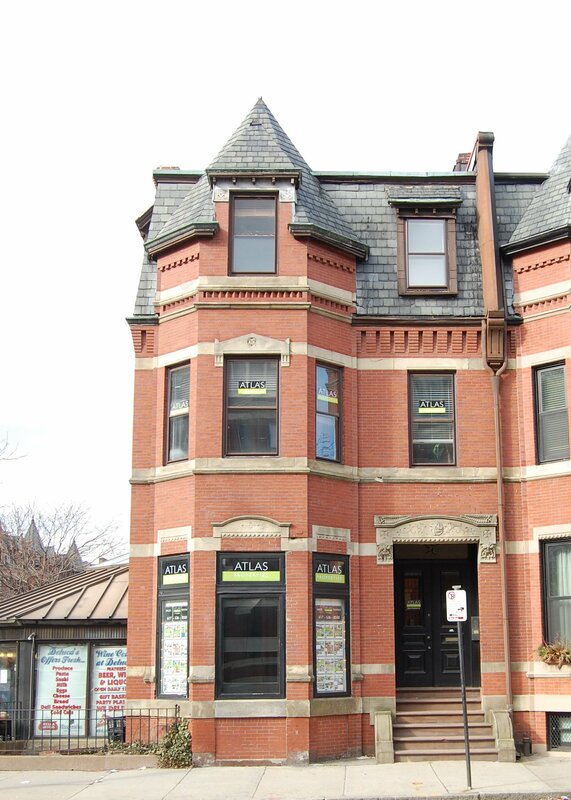 37 Fairfield (239 Newbury) remained a two-family dwelling and grocery store with take-out restaurant in 2016.